New Venture Creation—the Timmons Model: My own conclusion about what drives startups above all else is strongly influenced by the ideas of an amazing thinker, researcher and teacher, the late Jeffry Timmons. He was a professor at Babson College in Boston, and was once called the ‘Johnny Appleseed of Entrepreneurship Education‘—planting seeds wherever he went. Jeffry was viewed as a new venture creation pioneer thinker (and doer). I am biased, but I believe the Timmons model of new venture creation is as valid now as then. It is some of the best startup advice and helps founders to concentrate their minds on the essentials for success. He believed that the entrepreneurial process was not just about creating new companies, capital, and jobs, but also about fostering “an ingenious human spirit and improving humankind,” as he wrote in his 1989 book, The Entrepreneurial Mind, which will tell you more about the founder’s mind and new venture creation—the Timmons Model. His actual model of entrepreneurship (from his seminal book, New Venture Creation, though he developed it in his Harvard doctoral dissertation in 1971) shows the variables that have to be present for startup, but it all starts with the opportunity. The two other critical factors of a successful venture are teams, and resources. The successful entrepreneur is one that can balance these three components with the purpose of creating value for all involved. The opportunity has to be followed by the intention—and action to seize it. In new venture creation—the Timmons model, there has to be a willingness to take risks—both personal and financial But those risks must be taken in a calculated way, continually improving the odds of success, while balancing the risk with the potential reward. Typically, entrepreneurs devise ingenious strategies to marshal their limited resources. 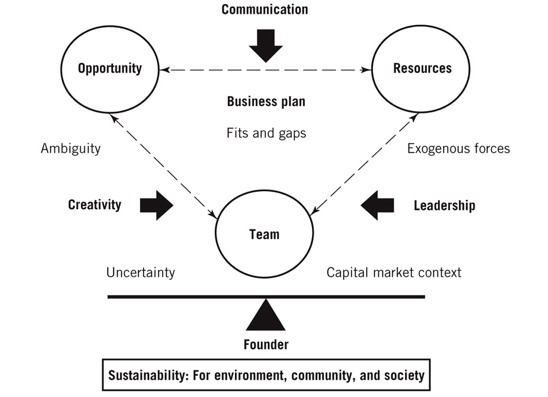 Despite the variety of business types, entrepreneurs, geographies and technologies, Timmons identified five central themes or driving forces that dominate this dynamic entrepreneurial process.